The transparent conductive oxide (TCO) is commonly used as front electrode in p-i-n solar cells. Its surface state has an important impact on the amorphous silicon (a-Si:H) nucleation, and hence on the device efficiency. Specifically, the TCO surface morphology should be controlled to assure the growth of a dense enough a-Si:H structure. Otherwise, ohmic current paths might develop in the solar cell, causing an electrical loss increase. The application of a plasma treatment allows the elimination of possible imperfections on the TCO surface. Thus, the final device shows a higher shunt resistance, and consequently a better performance. This work addresses the problem of the shunting behaviour observed in our a-Si:H p-i-n devices deposited onto sputtered ZnO:Al (AZO). 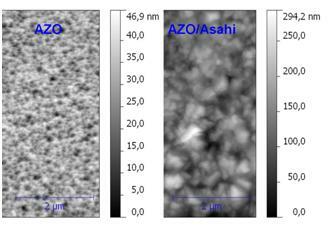 As a solution, a CF4+O2 plasma treatment was used to smoothen the AZO surface. For exposure times around five minutes, the elimination of surface defects led to a more compact a-Si:H structure, and a notable fill factor improvement was observed. Nevertheless, for long enough exposures, this dry-etching process caused an important deterioration of the AZO electrical characteristics. The effect of the CF4+O2 plasma treatment on the AZO bulk and surface properties was also studied.